Eating healthier is a top New Year's goal and many people turn to smoothies, believing they're a good way to get more nutrients in their diet. But some smoothies you buy can be loaded with sugar. 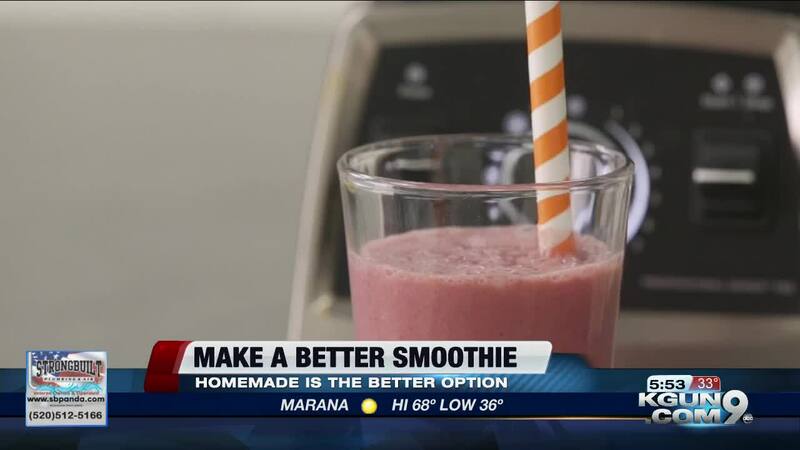 Consumer Reports food experts say that to make your smoothie really healthy, just make it yourself! Grace Choi and her daughter Kasper make cooking healthy a family routine. And they make smoothies incorporating produce the toddler might not readily eat. "Usually fruit she can eat pretty regularly, but vegetables are really hard," says Choi. Why start the day with a smoothie? "The advantage of smoothies over juice is that they contain the whole fruit, which provides fiber. It's also easy to add vegetables, protein, and even whole grains," says Consumer Reports Registered Dietician, Amy Keating. Begin with a protein base, like almond or regular milk, and yogurt. Not only is it good to have lots of fruits and veggies in your diet - it's even better to change them up, so you benefit from different nutrients. Your blender can work magic to combine fruits and vegetables that complement each other, like kale and pineapple! The fruit's sweetness dominates and the kale is loaded with antioxidants. Other great combos: Spinach and blueberries, oranges and steamed carrots, strawberries and beets. Look through your fridge, too. Any produce from last night's supper can boost your breakfast and put the brakes on food waste.